Happy Friday! I hope you had a nice week. I'm glad to report that my kitchen is now functional. Though it's not yet complete or ready for a final reveal, it's well on its way! 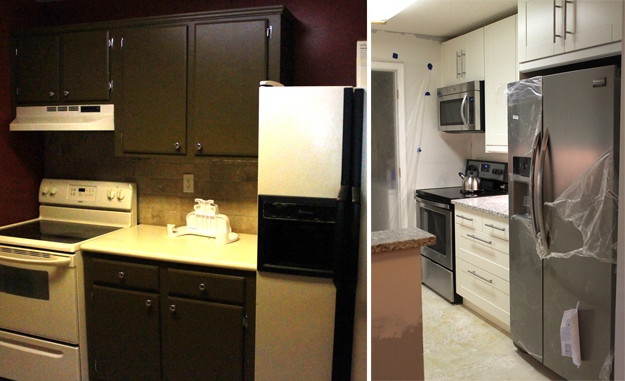 I started with 25 year old cabinets that were painted poo poo brown, red gloss walls, cream countertop, and ivory appliances. My condo unit faces north and without much natural light, the kitchen was extremely dark and depressing. My goal was to brighten it up and make it more inviting. Of course there are still several things that need to be done, but here are a few pictures of the progress so far. Since my David works all. the. time. and my dad said he would do it if he were 10 years younger, I had to hire help. Enter contractor David from Peru, who is my David's dad's neighbor. Because this is a condo, I didn't want to spend more than $10k total on this project. I went with Ikea while they had the 20% off sale for many of my items. I purchased the oven/range, microwave, and counter-depth fridge during a Lowe's Fourth of July sale (plus had an extra 10% coupon, plus used Ebates for additional cash back). I originally purchased a beautiful faucet but it was too tall for my space so I went with an Ikea one instead. 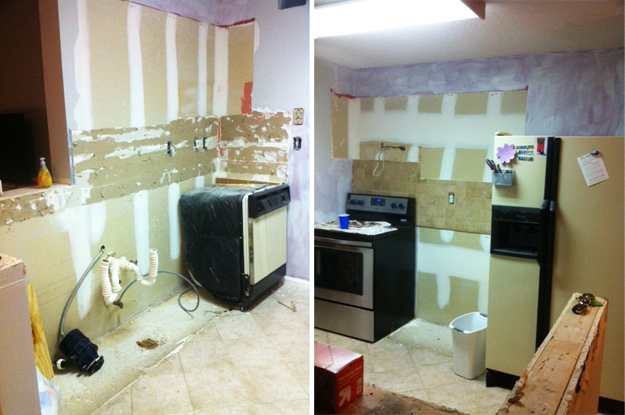 In addition, I kept the appliances in the original spots to reduce costs. 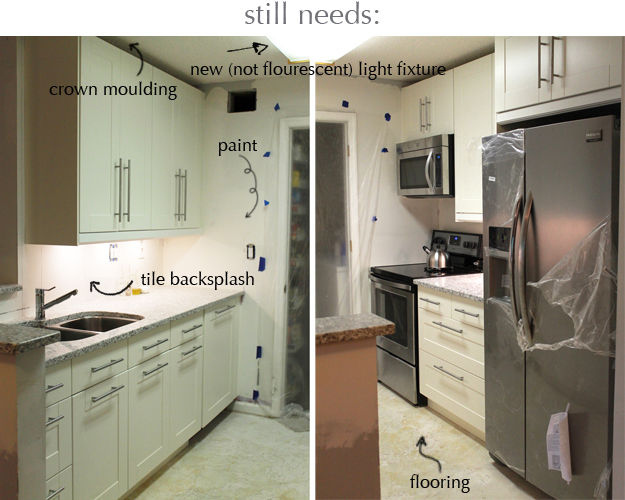 I'm also keeping the plastic on the fridge and the oven until this project is complete. I started priming the walls and the space brightened up so much! 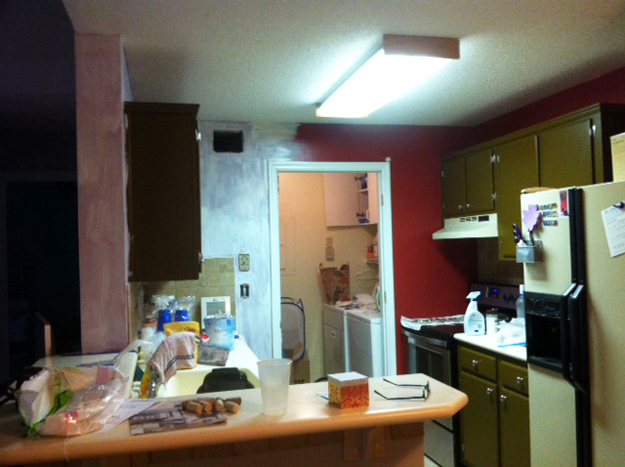 After demo-ing the cabinets and counters. 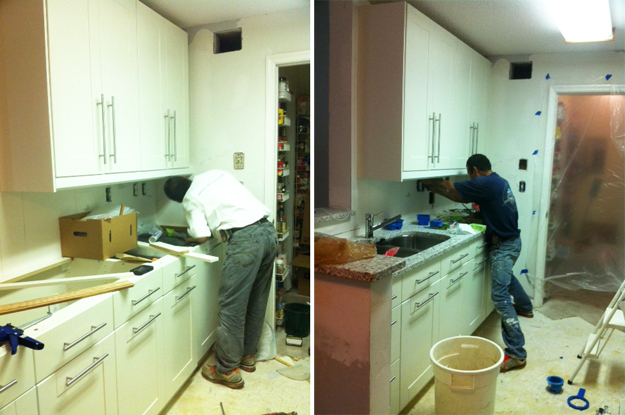 David from Peru working on things before and after the countertop installation. 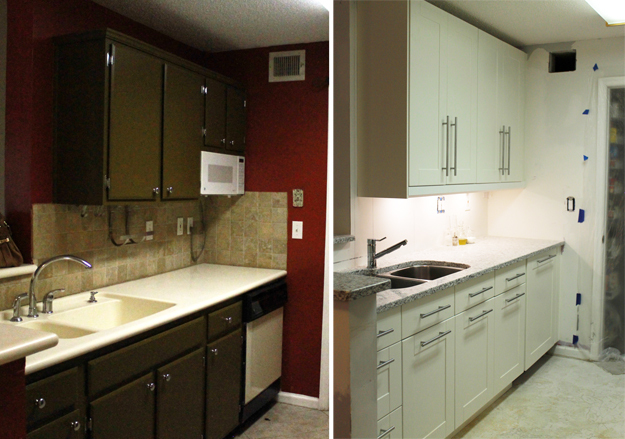 You had great foresight to know that you could transform that dark, drab kitchen! It looks wonderful, now!